2018 Hyundai Santro video leaked on Youtube! A video showcasing the 2018 Hyundai Santro interiors and exteriors has been leaked on Youtube ahead of its official launch on 23rd of October. The launch of the 2018 Hyundai Santro is just around the corner. Most of the details regarding this compact hatchback are already with us curtsey Hyundai Motor India. However, as the launch date comes closer and the company starts to ship vehicles to its dealerships, a number of images and videos have started spurting out on the internet. Recently we brought you the leaked images showcasing in details all the interiors specifics of the 2018 Hyundai Santro (Read More). Now, ahead of its official launch scheduled for the 23rd of October i.e. next week, a couple of videos have been leaked on Youtube. These videos showcase the interiors as well as the exteriors of the 2018 Santro in full detail. Hyundai has already revealed the exterior design of the new Santro. It looks nothing like the older generation model. On the outside, the new iteration of this compact hatchback is now quite contemporary and in sync with Hyundai’s Fluidic design 2.0. As also seen in the leaked video, up-front, it comes with the company’s signature cascading grille design. It comes with standard halogen headlamps and large, squarish fog-lamps. The side profile of the 2018 Hyundai Santro is plain and simple. However, to spice things up a bit, Hyundai has thrown in a slight kink on the rear window. It comes with steel wheels with wheel cover even on the top-end variants. However, to make things interesting, the top-end variants do get ORVM mounted turn indicators. At the back, you get a familiar Hyundai fascia. The squarish tail-lamps are tucked away nicely in an otherwise plain boot-lid. The rear bumper, in sync with the front one, gets some interesting design elements. The leaked video on Youtube also showcases the interiors of the 2018 Hyundai Santro. Through a series of recent leaked interiors images, we got to know the exact design layout of this compact hatchback’s cabin. In typical Hyundai fashion, the design of the dashboard is very premium. And by aesthetics alone, you cannot tell that it belongs to an entry-level hatchback. The dashboard gets a dual-tone colour layout of black and beige. In addition to this, the layout gets come interesting contouring which livens things up. Sitting in the middle of the centre console is a large touchscreen infotainment system flanked on either side by the large air-vents. The cabin gets ample of storage space. Overall, one can say that the cabin of the 2018 Hyundai Santro looks and feels very plush, definitely better than what you get in the current breed of entry-level hatchbacks. We are already aware that the 2018 Santro is going to come with a 1.1-litre, 4-cylinder petrol engine. This motor is capable of producing 69 BHP of power along with 99 Nm of peak torque. As standard, across all variants, this hatchback is going to come with a 5-speed manual gearbox. In addition to this, select variants will also get a 5-speed AMT unit which is developed in-house by Hyundai. 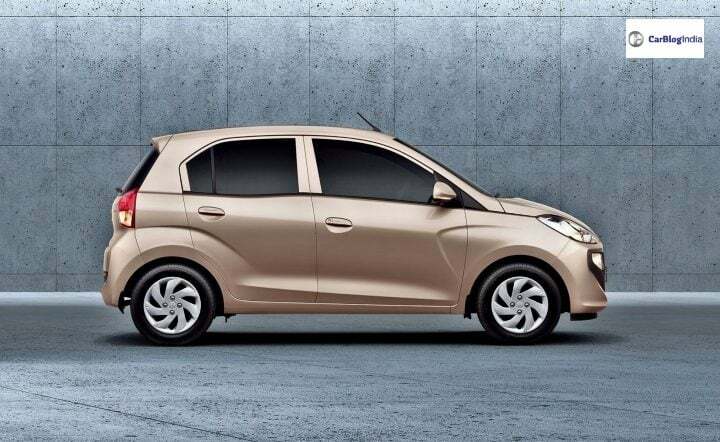 According to a leaked document, it is to be believed that the prices of the 2018 Hyundai Santro are going to fall in the range of INR 3.87 lakhs to INR 5.29 lakhs. The hatchback will go on sale in a total of 5-variants. The AMT gearbox and the factory fitted CNG kit will be available in two variants which are the Sportz and Magna.